SIZES 18 TO 32 - NAVY & BLACK - ONLY £11.99 + P&P !!! M&S Curve Size 24 Trouser, short, with double stripe down the leg Condition is New with tags. Dispatched with Royal Mail 2nd Class. M&S Ladies White Wide Leg 100% Linen Trousers Size 26 Length 26"
Ankle Grazer. 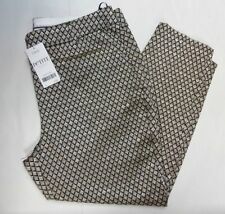 BNWT Ladies trousers from M&S - RRP £35. Inside Leg 25 long approx. 75% Cotton, 14% Polyester, 10% Viscose, 1% Elastane. 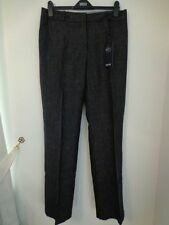 Ladies M&S Collection Navy Trousers Wide Leg Size 22 Regular, . Condition is Used. Dispatched with Royal Mail 2nd Class or courier. Width of leg at hem laid flat is 12", outside vent on each leg measuring 10.5", very good condition. Inside leg 30". Fastens with zip and decorative popper. No defects or marks. Gorgeous, light M&S trousers - size 22. Navy with white spots, wide leg style, partial elastication and waist ties. Excellent condition. Inside leg - approx. 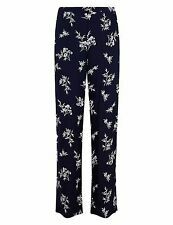 M&S Floral Silky Trousers Size 18 New. Dispatched with Royal Mail 2nd Class. 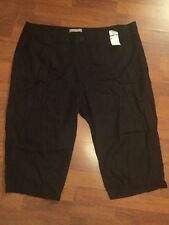 Ladies M&S palazzo pants black. Crepe style material. 100% Viscose. Elasticated at waist with tie at front. Waist measures 16 inches laid flat but can be adjusted to make smaller or bigger with tie. Excellent condition no marks or fading.